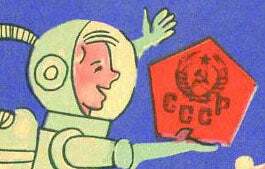 Three cartoon cosmonauts (one of them a woman) celebrate their lunar landing in this Soviet-era postcard. The fact that the Russkis have yet to walk on the moon makes it all the more adorable. Click through for a closer look. You can view more Soviet graphics pertaining to lunar conquest here, including a swell bunch of xmas cards.